Although it is not the highest mountain in the Lake Como area (that prize goes to Monte Legnone), the Grigna (pronounced "greenya") is by far the most prominent. For those of you that will be visiting the western shore of Lake Como, especially in the mid lake region, this is the mountain that defines the beautiful landscape that you will see. Grigna Settentrionale and Grigna Meridionale seen from the Western shore of Lake Como above Griante. The Grigna is part of a mountain massif rising up from the eastern branch of Lake Como and extending from the towns of Lecco to Bellano. The massif, which separates Lake Como from the Valsassina has two distinct peaks: the Grigna Settentrionale (North Grigna) and the Grigna Meridionale (South Grigna). The Grigna Settentrionale (also known as just Grigna or Grignone) reaches 2,410 metres/7,907 ft above sea level. The Grigna Meridionale (also known as Grignetta) is a slightly lower at 2,177 metres/7,142 ft. The summit of Grigna Settentrionale. 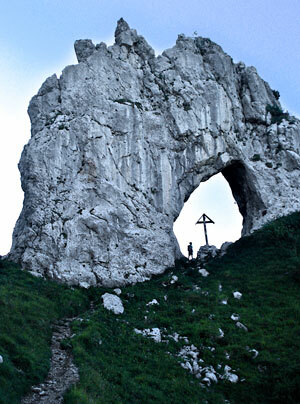 Despite their modest elevations relative to larger mountains in the Alps, these mountains offer alpine hikers, and even serious mountain climbers, a high altitude mountain hiking/climbing experience due to their steep and rugged calcareous rock formations which are reminiscent of the Italian Dolomites. Lesser peaks on the massive include Monte S. Martino and Pizzo della Pieve. There are many approaches to the summits of Grigna and Grignetta. They are of varying difficulty from moderately long hikes to expert mountain climbing. Here I propose a couple of routes to the summit of the Grigna Settentrionale that are easily accessible to those that are staying in the Griante area. The routes outlined below are safe if you do not stray from the route and use common sense and maintain respect for the mountain. They are suitable for anyone that enjoys a long mountain hike, however, a certain degree of fitness, sure-footedness, and freedom from vertigo are necessary. Hiking shoes or boots should be worn. A few spots, such as the final approach to the summit, are quite steep and in some places exposed. In these cases there are chains attached to the mountain that provide additional safety and leverage (see the photos). It is a good idea to carry a cell phone for safety; they work almost to the summit. There is a phone in the rifugio on the summit. 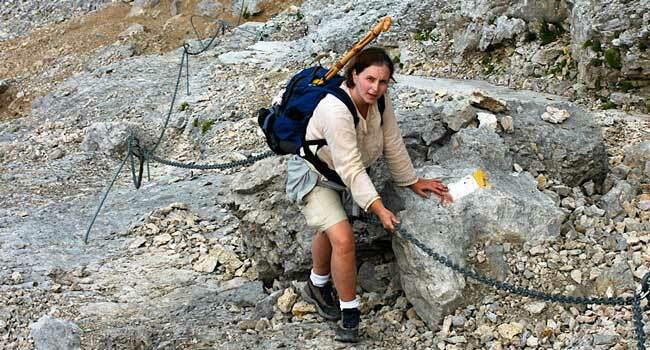 Final "climb" to the summit requires some assistance from chains attached to the rocks. The routes I propose have no access to fresh water, so make sure to carry water with you. However, both routes have a rifugio mid way up where you can get water and food. Water, food, and shelter is available in the rifugio on the summit. All the routes I propose can be completed (i.e. to the summit and back down) in one day with an early start. Typical times to reach the summit are around 3.5 to 5 hours. It is also possible to also stay the night at the Rifugio Brioschi located at the mountain summit, an experience that I highly recommend. My son first walked to the summit with me at the age of seven. He had some previous experience with mountain hiking, but the trip was less than relaxing for me since I needed to watch his steps very carefully. There are a few places on the trail that are exposed and will make a nervous parent skittish. But in the end we were both very proud to have made it up together, and my son has returned two more times since. I've seen people with babies in knapsacks walking to the top. You need to know what you and your child are capable of. 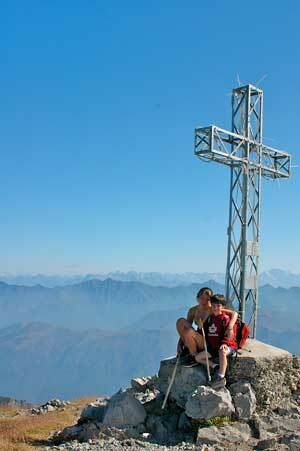 At the summit of the Grigna Settentrionale you will find the Rifugio Brioschi. The word "rifugio" literally means "refuge". A rifugio in Italy is usually a rustic mountain shelter or rest stop that often includes sleeping facilities, typically bunk beds in a large communal room. Open 365 days of the year, the Rifugio Brioschi is the only rifugio I know of in the Lake Como area that is literally perched on the summit of the mountain. It is the perfect rest stop for lunch, dinner, and even a night's sleep for those wishing to extend their hike onward or simply experience a night on the top of a mountain. If the weather is right, the sun setting behind the arc of the European alps creates a mountain sunset view from the Grigna that you will never forget. The quality of the food is decent considering the remoteness of the location (non perishable supplies are delivered by helicopter every now and then, while perishable foods, such as milk, butter, cheese, and meat are carried up on foot!). The menu is usually typical mountain rifugio fare which might be risotto, polenta with mushrooms, or a braised meat. One of the guys that runs the rifugio currently (at least as late as 2010) has perfected the art of baking at high altitude and usually serves up some kind of delicious (again all things considered) cake. 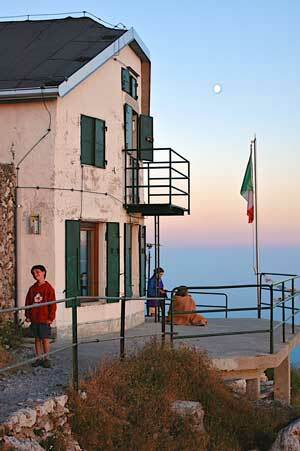 If you want to sleep at Rifugio Brioshi it is a good idea to call ahead and reserve a spot. There are a few "rooms" that are made up of three or so bunks, so if it is not crowded, or you are a small group, you may be able to get a little room that offers some privacy. There are no shower facilities - except for access to a large container of rain water that you could use to wash yourself down a bit. There are public washrooms, the conditions of which seem to vary from visit to visit. If you need to use the washroom in the middle of the night you will need a flashlight, always a handy thing to keep in your pack anyway. Remember that even in the middle of the summer, it can get quite cold at the top of the Grigna. It would not be unusual to experience night time temperatures well below 10 degrees celsius even when on the lake the day time highs are above 30 degrees celsius. If you venture up in early summer or fall, the cold is obviously more pronounced. For this reason, if you are sleeping over you should bring something like a windbreaker and warm fleece - in the fall or early summer maybe even hat and mits. For sleeping, the rifugio provides thick wool blankets that should keep you warm. There is a wood stove in the main room, which I've seen fired up in middle of summer, but it does not really heat the bedrooms which are upstairs. The routes I propose are both accessed from the central Lake Como side of the Grigna, and therefore are ideal for anyone staying in central Lake Como towns such as Bellaggio, Mennaggio, Varenna, or of course Griante. Access to these routes are from Cainallo, a very small ski area located above the town of Esino Lario which is in turn located above the lake side town of Varenna. By car, drive first to Varenna (take the Ferry across the lake from Cadenabbia or from Mennaggio if you are staying on the western shore). 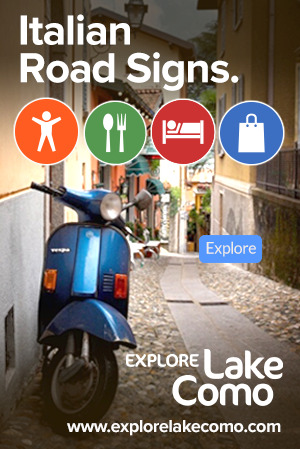 From Varenna continue by car following signs to Perledo and Esino Lario. The route to Esino Lario snakes up the mountain on a long and narrow, but well paved, road. Esino Lario is a small town high in the mountain above Lake Como. There are cafÃ©s, bakeries, and food shops here if you need a rest stop or some last minute supplies. In Esino Lario follow signs for Cainallo, DO NOT take the road that leads over the mountain and into the Valsassina (the Agueglio Pass). When you reach Cainallo continue on past the Rifugio Cainallo and stay on the road that sweeps around the ski area until you reach its end which is a large rocky parking area known as Vo' di Moncodeno (N45:58.802 E009:21.762, elevation 1419 meters). From here you will be able to access the hiking trails proposed below to the summit. From the parking area at Vo di Moncodeno take the trail on the right side marked with sign posts n. 25 Bogani-Brioschi, and n. 24 Bietti-Brioschi, n. 23 Monte Croce. Immediately after the first curve ignore the trail on the right marked with sign post n. 23 that goes to Monte Croce and the Bivacco Baitello dell'Amicizia. The trail begins with an incline and then has flat and rolling sections that follow the side of the mountain called Grumellone above the steep Valle dei Mulini. The trail then enters a forest of beech trees and alternates between some flat and steep sections, and after about a half hour to 45 minutes of walking from the parking area you will reach the intersection with Route n. 24 (m. 1590) which goes to Rifugio Bietti. Ignore this trail and instead continue straight along Route n. 25. The trail will descend slightly into the Val delle Lavinie. You will see on your left just below the trail two tower like rock formations called the Torrioni del Frate e della Monaca. As you continue on you will find a few places slide prone areas in the trail that have been bridged or reinforced with large wooden logs. When you reach the wooden gate, simply pass through it and continue on. It's purpose is simply to contain animals. Continue on ignoring the trail on the left marked no. 39 that goes to Prato San Pietro and the Valle dei Mulini, and instead proceeding to the end of the forested portion of the hike, and then eventually to an the Alpe Moncodeno (m. 1,700), a small alpine farm, with animals such as pigs, cows, and donkeys. The cheese from this farm can be purchased at Rifigio Bogani which you will reach shortly. At the farm you will also see a pond of water covered by large tree trunks that serves as a watering hole for cows. From the Alpe Moncodeno continue up the mountain along the trail. Ignore a trail that you may see on the right side marked n. 19 red Cresta di Piancaformia, Rifugio Bietti e Rifugio Brioschi and 19 blue Bocchetta di Prada, Esino o Mandello and instead continue on until you reach the Rifugio Bogani where you can take a likely well deserved break and enjoy a snack or some lunch. 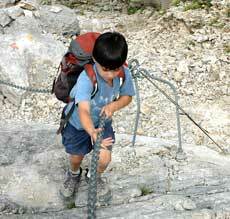 From the Rifugio Bogani you continue on Route n. 25. The terrain becomes virtually void of trees and is characterized by grassy areas with increasing amounts of white rock. Eventually even the grass will disappear and you will be left walking on the rocky terrain that is characteristic of the Grigna's higher elevations. As the terrain becomes more and more rocky, the clarity of the trail can sometimes be reduced. In this case you will be assisted by a number of markers that will show you the way such a: a red white and yellow flag painted on the rocks with the number 25 in it; yellow dots painted on the rock; and sometimes small circles on top of steel rods that are usually about 6 to 8 feet tall that are meant to show the way when there is snow. As you get closer to the summit the terrain becomes a combination of large gravel and hard rock. The gravel can be hard to walk on and care should be taken not to slip (especially when descending). In places where you need to walk over large rocks that expose you to a potential fall there is usually a chain or cable that you can hold on to for additional safety. There are two spots that will require a steep climb. The first is a small vertical wall that is no more than about 10 ft/3 m high with sufficient foot holds and a chain that you can use for assistance. The second is the last and final ascent to the summit, about 40 metres long, that is not vertical but steep enough that chains are provided for assistance. It is a wonderful final effort to the summit that provides an even greater sense of satisfaction when you arrive. Return the same way you came. The trail then enters a forest of beech trees and alternates between some flat and steep sections, and after about a half hour to 45 minutes of walking from the parking area you will reach the intersection with Route n. 24 (m. 1590) which goes to Rifugio Bietti. Take Route n. 24 on the right which begins very steeply with the help of some steps through a small forested area. From Bivacco 89a Brigata continue on Route n. 24 to Porta di Prada (m. 1670) a large arc shaped rock formation with a cross located in its centre. This is a great spot to take a break and take some spectacular photos of this interesting rock formation. From Porta di Prada continue again on Route n. 24 which will begin to actually descend to about 1610 metres before ascending and then descending slightly again once more before again ascending and then finally almost levelling off as you approach the Rifugio Bietti which you should begin to see in the distance. At the Rifugio Bietti you can take a break and enjoy a snack or some lunch. From here I propose Route n. 28 which is a steep ascent that begins immediately behind the rifugio and takes you up to the Bocchetta del Guzzi, on the Cresta di Piancaformia (the mountain's ridge). This route is a bit technical. It begins in a grassy area but quickly disappears in a sea of white rock, at which point you simply need to follow the yellow paint marks on the rocks which will show you the way up. Route n. 28 will end when you reach the mountain ridge, at which point you will go right and continue up the ridge. It's not really possible to take the ridge all the way to the summit, and at some point you will need to drop down of the rigde (to the left as you are going up) to hook up with the final portion of Route #25 described above. For the return, my recommendation would be to follow Option 1 described above in reverse as this is an easier descent. Diska.it's detailed descriptions of routes to many Rifugio's in Lombardia, including the ones to Rifugio Brioshi, and Rifugio Bietti. Piero Gritti's Web site (www.pieroweb.com) particularly his page on the Grignone. If you do not have a car it is possible to take the D21 bus from Bellano or Varenna to Esino Lario and walk from there to Cainallo and to the trail head. As I've never done this I am not sure how much time this would add to the trip, but I would guess about 1-2 hours or so. Porta di Prada Rock formation seen when taking Route 24. 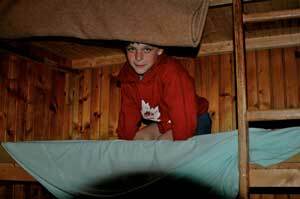 Getting ready for a night's sleep in one of Rifugio Brioschi's bunks.